The peak depolarization during an EPSP is reduced if there is an overlap in time with an IPSP. If the EPSP was just large enough to elicit an action potential in the absence of the IPSP, then the IPSP may reduce the EPSP so that it no longer crosses the threshold for production of an action potential (Fig. 8.6). When the motoneuron is prevented from producing an action potential in this way it cannot induce muscular contraction and so it is effectively inhibited. The motoneuron is in a sense a decision-making device. The decision to be made is whether or not to 'fire', that is to say whether or not to send an action potential out along the axon towards the muscle. If the incoming excitatory synaptic action is sufficiently in excess of the incoming inhibitory action, the resulting depolarization will cross the threshold for production of an action potential and the motoneuron will 'fire'. 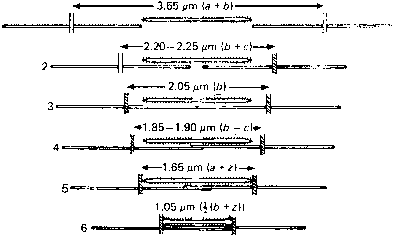 But a reduction in synaptic excitation or an increase in synaptic inhibition will make the membrane potential more negative so that it drops below the threshold and the motoneuron ceases firing. We should remember that the motoneuron receives excitatory and inhibitory inputs from many sources, so that, for example a 'decision' based on inhibition from group Ia fibres from an antagonistic muscle may be 'overruled' by excitatory inputs for neurons descending from the brain. Fig. 8.6. Interaction between excitatory and inhibitory PSPs in the motoneuron. 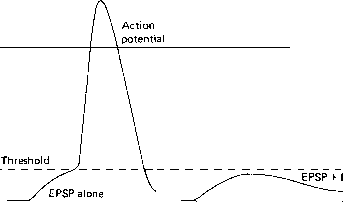 The diagram shows an EPSP which is just large enough to cross the threshold for excitation of an action potential. When an IPSP occurs at the same time, the combined result is insufficient to cause excitation, and so no action potential is propagated out along the axon. How doe EPSP & IPSP combine?